Twitter and Facebook are two totally different social media platforms yet there’s one thing about people trying to integrate their social media updates on both these platforms that’s really annoying to me. Facebook has the ability to automatically post your status update to Twitter. That’s great right? You only have to do one update and it’s done on two of your platforms. No, it’s not great, and here’s why. Facebook will allow longer status updates, and Twitter, as you probably know, only allows 140 characters. Therefore when you automatically send your Facebook update to Twitter, it truncates and adds a web address, like the below. The clue that if you click on the link and you’ll be sent to Facebook is the fb.me part of the web address. Many people do automatic posting to Twitter from Facebook for their brand page because the Facebook updates have to be public to allow Twitter users to be able to see them. The other Twitter statuses I’ve seen have been along the lines of “Like if you …….”. I can’t like your Twitter status. I can maybe favorite it, but ‘Like’ is a Facebook thing. I’m more likely to unfollow than anything. Because of the difference between how the platforms operate you’re really much better off posting to them separately. You have to monitor both platforms anyway right? Right? I hope you’re doing that. There’s nothing more frustrating for a follower engaging with you to be ignored. But maybe you don’t know how to disconnect the two. It’s easy. Go to Twitter, select your profile’s Settings. Click on Apps and Revoke access to Facebook. It’s easy. You might want to check out what else is connected to Twitter and do a spring clean while you’re there. Go and check. I’ll wait. If you want to check what Facebook is posting to Twitter, check it out at www.facebook.com/twitter. You can unlink Twitter from here as well. Other platforms can work well when posting to Twitter, like FourSquare and Instagram, just not Facebook. But that’s my opinion. What’s yours? Couldn’t agree more. I think the separate networks deserve their own content – and in particular participation in the unique conversations that occur in both. I don’t mind the occasional cross-promotion or linking, but as an automated feature – no. Good one Jenny. Thanks Michelle. Usually when I see the fb…. link I know it goes to Facebook and I don’t bother clicking. I’ve seen more than one brand do it and it’s very annoying. It makes them look lazy I think. I agree to a certain extent. It all comes down to how aware you are of the connection. The tone we go for never asks people to like or RT posts, we prefer to let the content speak for itself, and so we rarely fall into a trap of asking someone to do something on a platform that they can’t do. We also keep FB updates as short as possible to allow easier sharing to FB. When it’s done poorly it looks horrible, and we are still experimenting, but if you are aware that it’s going to happen then you can plan for it and use it to maximise your efficiency across platforms. Thanks James. I agree if there’s a plan as you’ve outlined then the simultaneous updates could work. The only downside I can see is if you’ve got people following you on both platforms getting sick of seeing the same updates on both sites. I have never found that to be a problem, probably due to the speed of twitter. In my experience people are used to, and okay with, seeing a piece of content fly by a few times. 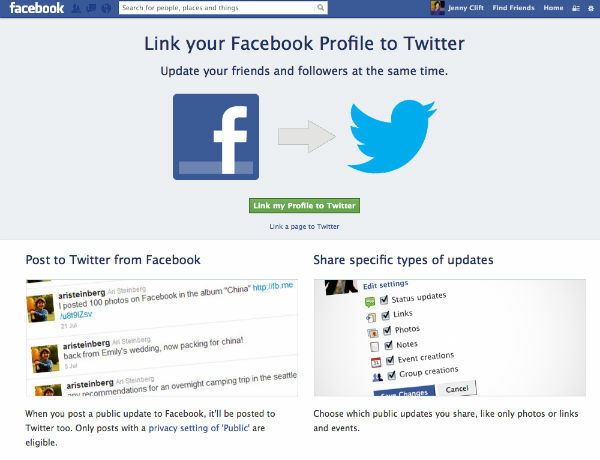 In fact I wonder if by running it through FB it takes on enough of a new ‘look’ to register as new to the Twitter user. Perhaps not, but I don’t know for sure. RiAus is also in a position where the majority of people who follow us are advocates and are not simply looking for a coupon or something. When I really believe in a cause I don’t mind seeing the info pop up more often and have often RT’d etc. multiple times on my personal account. It might be that this is a point of difference for Not-For-Profits compared to other corporate accounts. I wonder how many people automatically post to Twitter without even realising it. Probably a few judging from lack of engagement on Twitter from some.